It is not a secret: new people can bring new opportunities in our societies. Also economic opportunities. Aljazeera sums up pretty good the topic in this regard. By concentrating on the opportunities we can increase diversity and future-proofness in our communities. Many experts utilize already their skills for this purpose. Amongst them are architects and urban planners, who take social responsibility and provide humane places to live and create. Therefore it was not a big surprise when the Austrian Pavilion of the 2016 Architecture Biennale was not limited to the pavilion in Venice but also showcased at the same time three ongoing projects in Vienna. This Venice-Vienna connection managed to stick out and reach more audience. The list of entrepreneurs and students initiatives is growing. Some participated already in the “living the cooperative city” workshop in Berlin. The Viennese initiatives will participate in the arriving to the cooperative city: the vienna reugee coalition. We want to continue the debate in the digital world. 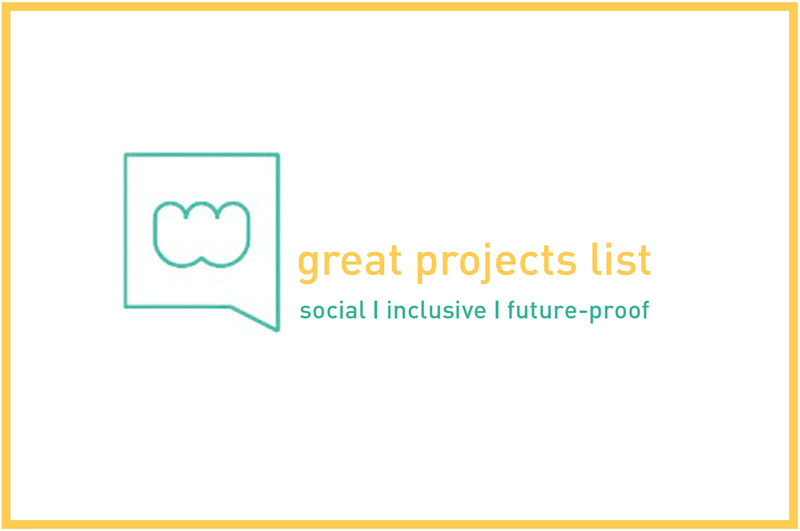 Please help us to complete this list of great project worth spreading. Feel free to like, share, visit, portrait, write about, take a picture, tag, and recommend. Please accept also our invitation to publish here your great project. Last but not least write us about your favorite project. We are looking forward to your responses. Bockwerk in Vienna (AT) is an atelier for refugees. In this workshop high-quality design objects are built a place together with designers and architects. Former refugees are running Magda’s Hotel in Vienna (AT). In this hotel you can also obtain the WAllPAPERS FOR REFUGEES. Those wallpapers illustrate typical Austrian sayings. On the one hand the papers shall help to communicate and your donation will help the project. Displaced in Vienna (AT) is an initiative of TU Wien students in collaboration with the Red Cross building. The living space of refugees in the house is cooperatively changed, adapted and furnished. A long-term research project is called Fluchtraum Österreich. The goal is to investigate the spatial structures and borders that are being created and built around asylum seekers in Austria. The initiative CHANCEN:REICH in Vienna is planning to integrate refugees into the workforce. The association Purple sheep Vienna hosts asylum seeker families, which are just about to be deported, event though they have sustained their live for years, learned the language, are “integrated” and have no negative records. They operate the purple eat market in Meidling Vienna to finance themselves. In Vinzirast-mittendrin former homeless and students live, work and learn together in the same house. EOOS Social Furniture in Vienna is a catalogue of strategic furniture DIY-manufactured on site. The creation of work, implementing new functions like communal kitchens, workshops, high planting beds and shops, empowers the participants to adapt the space according their needs themselves. Also in Germany new initiatives are popping up frequently. In preparation is the Hotel Utopia in Berlin. Upon 2017 it wants to offer next to work a place for education for refugees. Kommen und Bleiben in Berlin is a project platform where students and refugees develop and realize in cooperation. Kitchen-Hub / Habitat Unit by students of TU Berlin is a modular toolkit to support the agency of refugees as urban actors. Cucula, Berlin is an association, a workshop and an educational program all in one. Campus Cosmopolis in Berlin is a center for autonomous and communal living and learning of old and new Berliners. The refugee cantine in Hamburg wants to train in just 24 weeks people with migrant or refugee background for gastronomy jobs. Had enough of the cantina food? refuge’EAT in Munich addresses this issue and cooks with refugees traditional recipes, to deliver to companies, the income is reinvested refugees food. A not used church is transformed in a popup Hotel total in Aachen. The guests are homeless or refugee. The combination of hotel and refugee quarter realizes the Hotel Cosmopolis in Augsburg. Next to the living space and guestrooms, space for workshop and a café is installed as a meeting room. The design studio Refugees Welcome in University Hannover explores the design requirements for a humane housing. not bound locally digital platforms can bring people together over greater distances. The job exchange platforms for refugees and employers is called Workeer and refugees work. Globally less than 1% of refugees have access to higher education. Digital platforms providing education are Kiron Open Higher Education and ReDI School of Digital Integration. Singa France is a matchmaking platform for temporary shelter that allows flat sharing from 1 to 9 months. It connects refugees and individuals. another wonderful project to be listed and followed: http://wirmachendas.jetzt/en/about-us/ above 1200 people bring in their full expertise to support refugees and migrants in berlin. irgcgw,Some really nice stuff on this website, I enjoy it. hjuxinojde,Thanks for sharing this recipe with us!! ckobzipl,A very good informative article. I’ve bookmarked your website and will be checking back in future! mwpeobqck,Some really nice stuff on this website, I enjoy it.